The new Lilienthal 31 is a joint development in conjunction with the DMFV (German Model Flyers Association) for youth work in model clubs and schools. Launched by Towline or Hi Start an Auto-Rudder is used to transition in to circular flight. No D/T is shown but the experienced modeller could fit one or even micro RC. The Lilienthal is of all-wood construction, and is covered in tissue. 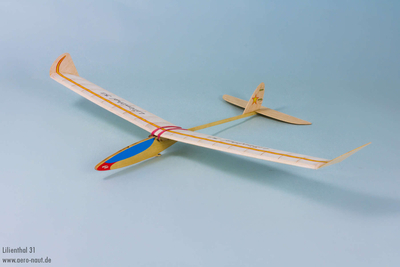 The wing features a flat-bottomed airfoil to eliminate any problems in construction. All the balsa, obechi and plywood parts are accurately laser-cut. The leading and trailing edges are machined to section and slotted to accept and support the ribs at the correct positions.